Legendary Comrades ultra-marathon athlete, Bruce Fordyce is the true epitome of stamina. the good they are doing for so many South Africans by organising Park Run’s all over the country. The characteristics that make this rose so tough are the fact that a strong, base framework of semi-spreading main stems is quickly and easily established. From here the plant produces an endless supply of upright shoots bearing huge, perfectly symmetrical, full, fragrant blooms. 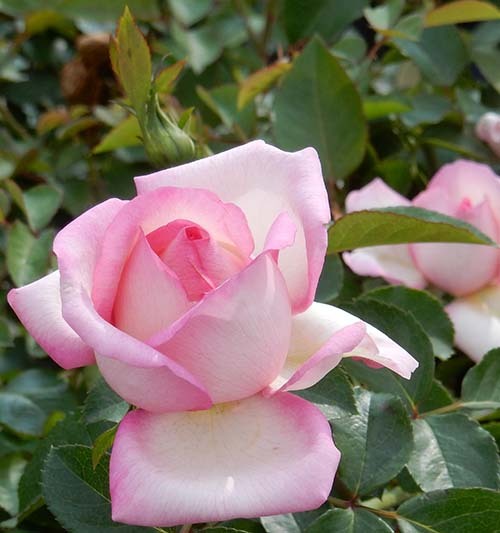 Each cream-white based petal is pigmented with pink that concentrates towards the edge. Every eye on every stem grows robust, leathery leaves that are impervious to fungus infection. These chlorophyll laden leaves are filled with power. They absorb sunlight, photosynthesise and in turn feed their roots with energy to grow wide and deep, creating a perfect circle of stamina.